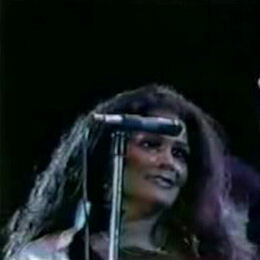 To Bob Dylan obsessives - of whom I'm not one - are familiar with Madlyn Quebec as a member of his background singers "The Queens Of Rhythm" in the 1980s and as a name of the back of LPs such as "Knocked Out Loaded". It's pretty sure she got this gig as her daughter Carolyn Dennis had also sung background vocals for Dylan from the late 70s. Dennis married Dylan in 1986 and I'll bet Madlyn's new role as Bob Dylan's mother-in-law was a real conversation stopper at parties. However for soul fans she is remembered fondly for her role as a Raelette in the late 70s and early 80s but sadly not so well known for her 45s. But all four of her solo recordings are first class. 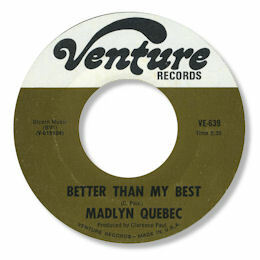 The first was for Mickey Stevenson's Venture label and is a double sided winner. Better Than My Best is based on classic gospel chord changes and the small band and female chorus behind her make the point crystal clear. On top Madlyn sings with great verve and passion, full of righteous fire. "The Love I've Been Looking For" is more uptown, veering towards a show time ballad, but is still clearly a soul performance from Madlyn, singing her heart out over a very full orchestra. Interesting to see Ernie Shelby's name as co-writer and co-producer. 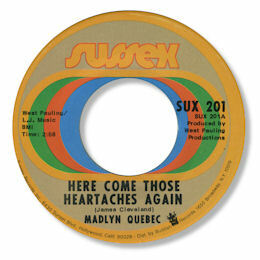 Madlyn's only Sussex 45 features one of her very best vocal performances on the heavy deep soul ballad Here Come Those Heartaches Again. This was another gospel song, this time from the prolific James Cleveland, and as with "Better Than My Best" comes complete with a sensitive and highly professional production from Clarence Paul. The Tangerine sessions were a mixed bag. Her first 45 was the absolutely magnificent Will I Ever Get Back Home penned by Ray Charles himself and the great Jimmy Holiday. This benefitted from a very atmospheric production which created a real sense of longing and regret over which Madlyn sounded desperate and lost, controlling her fierce vocals down to a whisper at times and cutting loose to emphasise the lyric. Simply magnificent. Sadly her second Tangerine 45 doesn't match this brilliance. Dee Ervin's production on the socially conscious "Check It Out" was rather ordinary and the country aspect of "Love's All I Want" was reinforced by the inclusion of a banjo - a huge error. 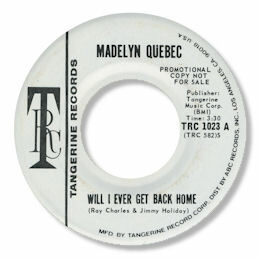 And that single was the end of Madlyn's solo career - but I'm sure the later phase of her time as a singer was much more lucrative even if the artistic results don't do much for me. UPDATE ~ My friend John Lias has reminded me that Gene Chandler cut a really fine version of " Here come those heartaches again" - he adds "Gene' s version was entitled " Tell me what can I do ". It was a b side to his " There goes the lover " single and also appears on a Brunswick CD ("The Soul of Gene Chandler"). John much prefers Gene's cut to Madlyn's - I love them both.